Tunisia, the small north African country which lit the first spark of the Arab spring when its popular uprising toppled the dictatorship four years ago, has been plunged into shock after gunmen killed at least 20 people, including at least 17 foreign tourists, in the worst terrorist attack in more than a decade. The targeting of tourists by terrorists is a new phenomenon in Tunisia and a massive blow to a country whose struggling post-revolution economy depends largely on its beach resorts and foreign visitors. Tunisia, which peacefully elected a new Parliament in December, has prided itself as a model of political transition since the overthrow of the brutal authoritarian Zine El Abidine Ben Ali in 2011, in contrast to the post-revolutionary difficulties of its troubled neighbours. But it has also been struggling to tackle the growing terrorist threat in the region and thousands of Tunisians have left to fight foreign jihad. The attack immediately raised questions about the Islamist terrorist threat to Tunisia amid mounting anxiety that jihadi violence is spilling over the border from neighbouring Libya, as well as Algeria. Three Italians as well as visitors from Germany, Poland and Spain were among the dead, as well as a Tunisian cleaner and a security officer. Around 22 other foreigners were wounded. The attack began just after midday as gunmen armed with kalashnikovs opened fire in front of the Bardo museum, the country’s largest and a major tourist attraction, which houses one of the world’s biggest collections of Roman mosaics and is built in a 19th century palace adjacent to parliament. As the gunmen struck, tourists were getting out of coaches to visit the museum on a spring day that had seen scores of visitors, many from cruise ships docked in the port for the day. Tunisian security forces entered the museum and shot dead two gunmen at about 3pm local time (1400 GMT). MPs had been in parliament nearby debating new laws which were to include an anti-terrorism bill. After the shots began, the parliament session was suspended and MPs were evacuated. The tourists were also later ushered out of the museum as security officials warned at least two or three accomplices of the gunmen might be at large. More than 100 European tourists freed at the end of the siege were driven out of the museum gates, their faces showing a mixture of anxiety and relief. The mixture of men and women, young and old, stared out into space, some giving smiles at crowds still packed outside the gates. One young blonde woman inside the first bus grinned and waved her hand. Dozens of armed police and troops remained inside the museum complex sealed off from the city. One Italian couple celebrating their 50th wedding anniversary on a cruise ship told the Italian newspaper La Stampa how fellow holidaymakers had been rushed from the museum back to the ship. “All of a sudden we saw them all rushing back on board. There was panic among those who had managed to get away from the terrorists,” the newspaper quoted them as telling a friend. There was shock that terrorists had managed to launch an attack at the very heart of the capital. Police set up checkpoints and a policeman with a machine gun was posted outside the office of the UK’s British Council. “There is a possibility, but it is not certain, that [the two gunmen] could have been helped … and we are currently conducting extensive search operations to identify the two or three terrorists who possibly participated in the operation,” the prime minister, Habib Essid, said. The museum assault was the worst attack involving foreigners in Tunisia since an al-Qaeda suicide bombing on a synagogue killed 21 people on the island of Djerba in 2002. The attack came the day after Tunisia announced arrests of a jihadi group trying to infiltrate the country, and in the week a key Tunisian militant was killed in Sirte. Troops are deployed on the Libyan border to stop suspected terrorist groups bringing in men and equipment. There have also been concerns about the Mount Chaambi area on the border with Algeria where al-Qaeda in the Islamic Maghreb has reportedly been helping a Tunisian group that has killed numerous soldiers. Although the country has been more stable than others in the region, a disproportionately large number of Tunisian recruits – some 3 000, according to government estimates – have joined Islamic State (Isis) fighters in Syria and Iraq, triggering fears some will return to mount attacks back home. The American embassy in Tunis was attacked in September 2012, seriously damaging the embassy grounds and an adjoining American school. Four assailants were killed. 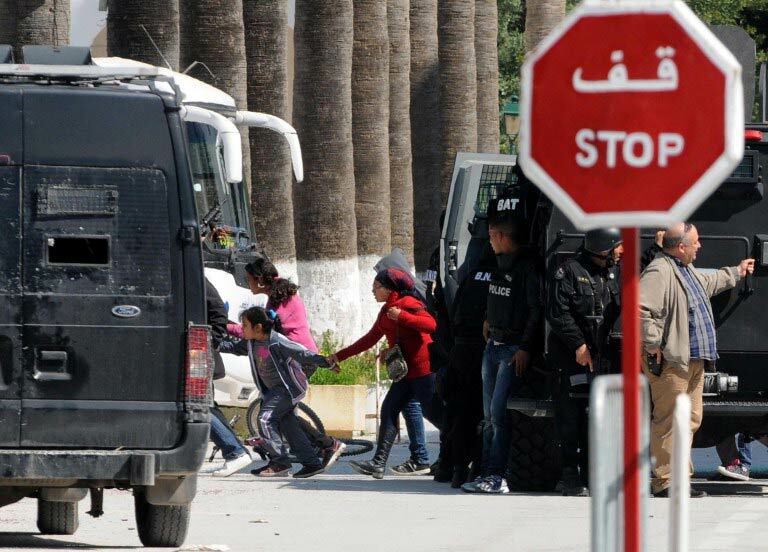 Overall, though, the violence that Tunisia has seen in recent years has been largely focused on security forces, not foreigners or tourist sites. In 2013, two opposition figures were assassinated in Tunis and, in what is believed to be the first suicide bombing in Tunisia , a man walked off the beach in the resort town of Sousse and blew himself up in front of a seaside hotel. He was the only fatality. The US secretary of state, John Kerry, said Washington condemned the attack and continued “to support the Tunisian government’s efforts to advance a secure, prosperous, and democratic Tunisia”. The EU’s foreign policy chief, Federica Mogherini, blamed Isis, saying in a statement: “With the attack that has struck Tunis today, the Daesh [Isis’s Arabic acronym] terrorist organisation is once again targeting the countries and peoples of the Mediterranean region. Two suspected child suicide bombers blew themselves up in a market in northeast Nigeria on Sunday, witnesses said, killing three people in the second apparent attack in two days using young girls strapped with explosives. 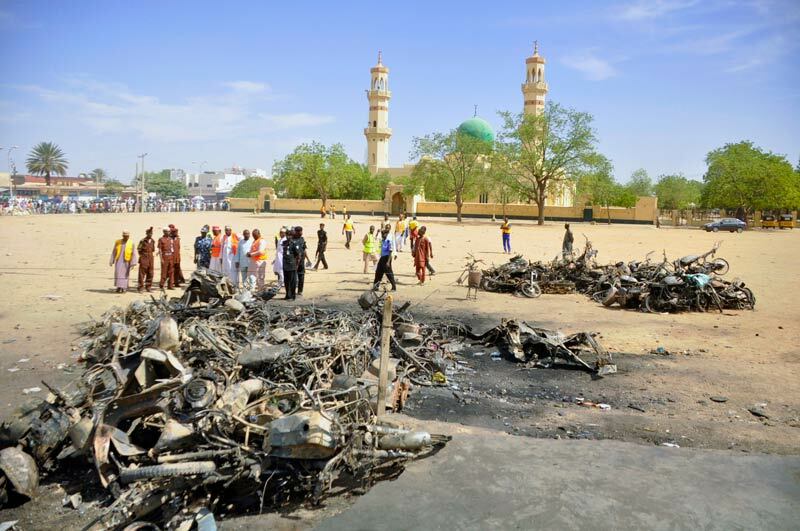 The blasts struck around mid-afternoon at an open market selling mobile handsets in the town of Potiskum in Yobe state, which has frequently been attacked by the Sunni Muslim jihadist group Boko Haram. A trader at the market, Sani Abdu Potiskum, said the bombers were about 10 years old. “I saw their dead bodies. They are two young girls of about 10 years of age … you only see the plaited hair and part of the upper torso,” the trader said. A source at the Potiskum general hospital said three people had been killed, excluding the bombers, while 46 were injured. The town was hit by a suicide bomber in November when at least 48 people, mainly students, were killed during a school assembly. On Saturday, a bomb exploded at a police station in Potiskum. Boko Haram has been waging a five year insurgency to establish an Islamic state in the northeast of the country and the army’s inability to quash the movement is a headache for President Goodluck Jonathan, who is seeking re-election in February. The military lost ground in worst-hit Borno state last weekend after insurgents took over the town of Baga and nearby army base, killing over 100 people and forcing thousands to flee. The defence headquarters said on Saturday that the army was regrouping to retake the area. In the city of Jos in Plateau state, Jonathan’s campaign team was hit by two days of violence. The driver of a campaign vehicle was killed on Sunday by youths who also set fire to a police station, police spokesperson Abu Sunday Emmanuel said. On Saturday, two other campaign vehicles were burnt. “The youths were chanting no PDP, no to Jonathan Badluck,” a witness said, referring to the ruling People’sDemocratic Party. PDP spokesperson Olisa Metuh said in an emailed statement that the government “decried last Saturday’s unprovoked attack on President Goodluck Jonathan’s campaign vehicles in Jos”. Kenya’s government has offered an all-expenses-paid holiday in Kenya to a 15-year-old American teenager and her family after police mistook her for Samantha Lewthwaite, the British terrorist suspect nicknamed the “white widow”. The teenager was “harassed by police in Mlolongo”, outside the capital Nairobi, “on accusations of looking like” Lewthwaite, the government said. Joseph Ole Lenku, Kenya’s interior minister, announced that “the government will sponsor a fully-paid holiday for the family” to make up for the incident and that police were also investigating. Lewthwaite was married to Germaine Lindsay, one of four Islamist suicide bombers who attacked the London transport network on 7 July 2005, killing 52 people. The 30-year-old Muslim convert has been linked to Somalia’s al-Shabab rebels, who have launched a string of attacks in Kenya including the assault on Nairobi’s Westgate shopping centre that claimed at least 67 lives a year ago on Sunday. There has been no confirmed sighting of Lewthwaite since she gave Kenyan police the slip in Mombasa in 2011, reportedly using a false South African passport. Last month Kenyan detectives hunting her said the trail had gone cold. 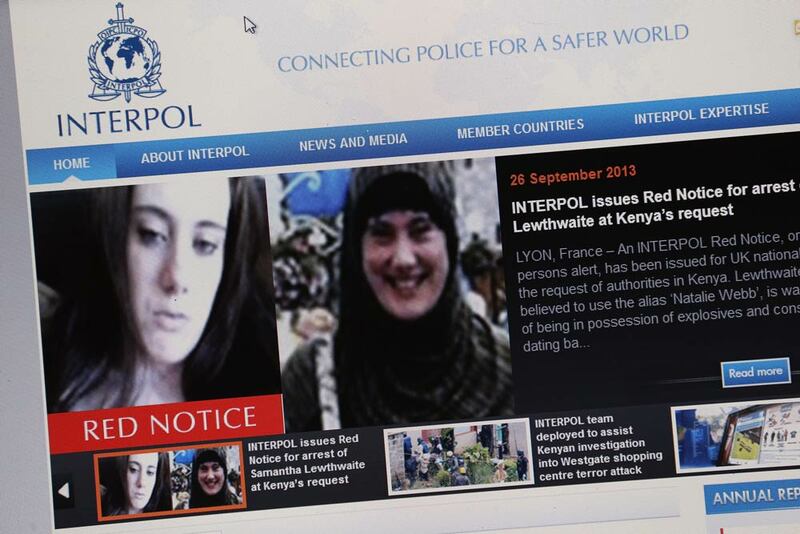 She is wanted in Kenya on charges of being in possession of explosives and conspiracy to commit a felony dating back to December 2011, and is the subject of an Interpol “red notice” warrant for her detention issued at Kenya’s request. Kenya began emotional commemorations on Tuesday to mark the first anniversary of Nairobi’s Westgate mall massacre, remembering the 67 people killed by Somali Islamist gunmen and those who risked their lives to stop them. In a speech at a memorial site opened at the capital’s National Museum, First Lady Margaret Kenyatta said the East African nation had been “seriously scarred” but was not broken by the attackers from the al-Qaeda-affiliated Shabab rebels. “This is a time that brings much pain and sorrow to many, and is still a time of healing, [we] having also lost members of our family in this senseless massacre,” said Kenyatta, whose nephew and his fiancee were among those killed. “The nation may have been seriously scarred but we shall never be broken as a people,” she said. A week of memorial events opened with an emotional film called Our Nairobi, which included testimonies of those caught up in the attack. Our Nairobi – Rama Manikumar from Arete Stories on Vimeo. The four Shabab gunmen stormed the upmarket mall on a busy Saturday afternoon on September 21 2013, hurling grenades and shooting scores in cold blood with automatic rifles. “We saw people panic, running and screaming everywhere all around the mall,” said Rama Manikumar, who was having a drink in a cafe when the shooting started, and whose testimony was featured in the film. “It was like a battlefield, the whole place was in smoke, there were no lights… a lot of broken glass and ammunition on the floor,” she said. The shopping centre was crowded with hundreds of shoppers, friends meeting for a meal, as well as a children’s cooking competition. “I want Kenya to be back to itself, to have peace, harmony, love, and things like terrorism to never happen to us again,” said Kennedy Mungai, who had been working as a waiter at a cafe when the shooting erupted. 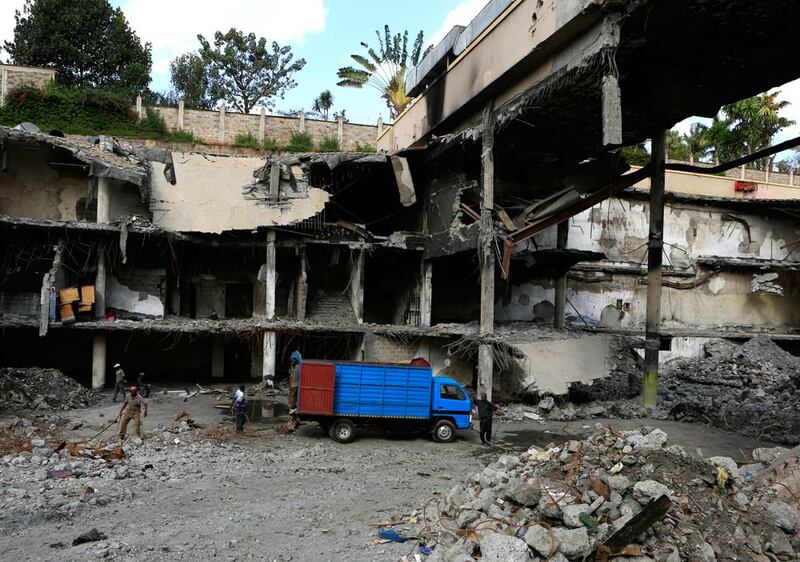 Shoppers were hunted down in supermarket aisles and killed, in what the Shebab said was revenge for Kenya’s sending of troops to fight the extremists in Somalia as part of an African Union force. Kenyans, however, are hoping that the commemorations will also show how people were brought together in face of the horror. Ranju Shah recounted how she and others had hid themselves in a storage area for two hours as fighting raged, with Kenyans from all ethnicities comforting each other. Prayers will be held on Sunday, exactly one year after the attack, with a memorial concert and candle-lit vigil for the following three nights. 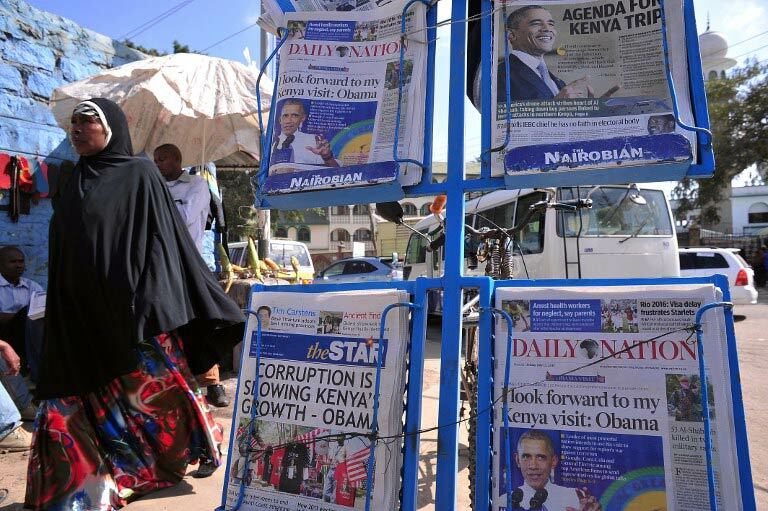 Although Kenyan security forces were criticised for looting stores during and after the attack, The Standard newspaper said the country should pause to honour those who risked their lives to enter the gunfight in the mall to try to save lives. “Some of the officers who went into the mall to engage the terrorists carry deep physical and emotional wounds… we need to celebrate them all,” it said in an editorial. All four gunmen are reported to have died in the mall, their bodies burned and crushed by tons of rubble after a major fire sparked by the fighting caused a large section of the building to collapse. Al-Shabab remain a major threat, and continue to launch attacks despite advances by African Union troops inside Somalia, and a US air strike killing its chief earlier this month. The extremists have launched a string of subsequent attacks in Kenya, including a wave of massacres in the coastal region, which has badly affected the country’s key tourist industry.